All about Belgian Beers. 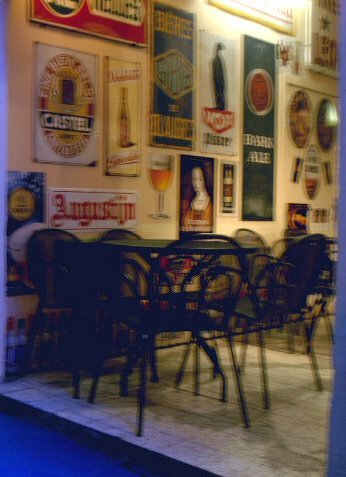 Belgian Beer Bars. Belgian Beer Breweries. A discovery of the many Belgian Beers. In a nutshell Belgium and Belgian Beers. www.belgian-beers.eu Cheers! At the moment I am trying the beers widely available in the Belgian supermarkets – one by one. I have identified a couple of beers I really like, unfortunately though these are not available in big supermarkets. Yet, there are quite few beers to discover in the supermarket. Among them the Corsendonk Pater. This beer is surprisingly sweet when taking into account its alcohol content, 7,5%. Brewed according to old abbey recipes, the bottle still bears an ancient religious silk drawing. 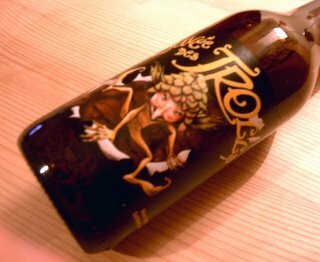 The Cuvee des Trolls is a beer we bought purely based on the name and the label. I never heard of it before, but it was too difficult to resist the label. 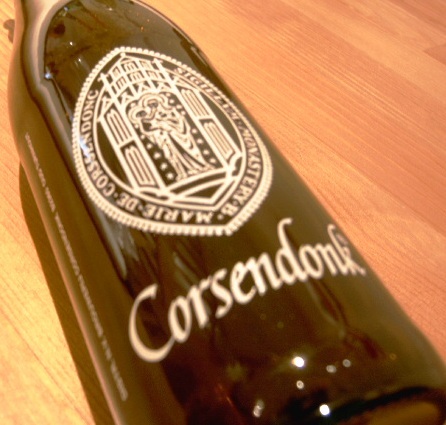 The beer is brewed by the Dubuisson Brewery, which was created in 1769, making it the oldest brewery in Wallonia. Among the best-known beers of the brewery is the Bush beer, however this time around I tried the Cuvee des Trolls. Besides these two beers, Dubuisson produces the Bush de Noel (12%), the Bush Blonde (10,5%), and the Bush Prestige (13%). The Cuvee des Trolls is a blond beer, fresh, full and well balanced, beautifully scented with dried orange peel. And why is it called the Cuvee des Trolls (the cave of the trolls)? Well this and much more can be found on their website where the legend of the trolls and the beer are explained into great detail. Mind the trolls jumping up and down the screen! Just because I kept mentioning it. Plus it is a bar which helped us dicover yet more Belgian beers. A la Mort Subite. It’s been a busy couple of days beer wise. 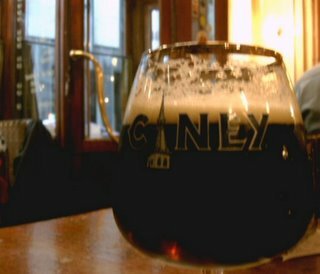 We discovered new beer bars in Brussels, and tried out plenty of beer. Some really stuck with me, others were part of the Belgian discovery tour. Part of the beers tried was also Ciney. Produced by Alken-Maes, like Mort Subite and the Hapkin, Ciney goes back to 1978 (that’s one year after I was born – pure trivia for you). There is a blonde and a dark Ciney. While in the A la Mort Subite we tried the dark Ciney. It is a brown beer, with subtle red hues, and a mild aftertaste. 7% alcohol. I assume this can only happen in Belgium: a supermarket assigning an abbey to produce beers just for this particular supermarket. Not that I had an idea about all this before buying the beer. 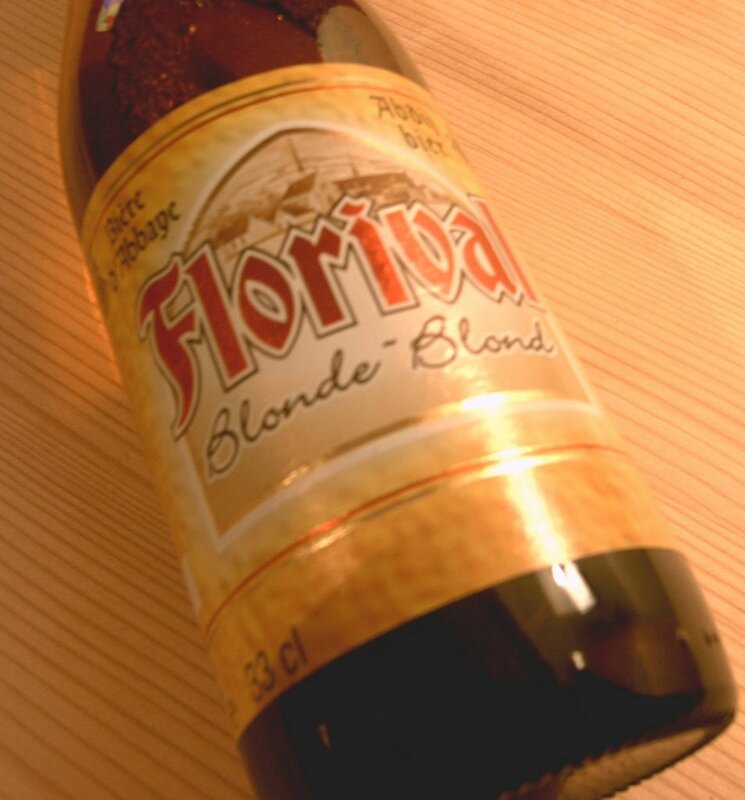 But indeed, it seem Florival has been especially ordered by the Delhaize. In a bowl mix the beer, the garlic, shallots, Worcestershire sauce, chilli, orange juice, sugar and mustard. Add 2tbsp olive oil. Cover the rum steak with the marinade, and leave for at least 1h. Heat the oven / barbecue. Pour the marinade into a bowl. Bring to the boil, then turn down the heat and reduce the sauce. Dry the steaks and sprinkle some olive oil on top. Grill the steaks 2min on one side, 1min on the other. Seazon. Serve with the beer sauce. Knut Albert mentioned in his comments he enjoys not only the beer, but also the scenes 'behind the beers', namely the Belgian bars. Here is a typical shot of one, the Delirium Cafe a must for every beer lover (or not!). A new discovery for me, but such a lovely beer. I loved the aroma, the slightly toasted and nutty, yet sweet taste. Oh, and the name. But then again what’s in a name? 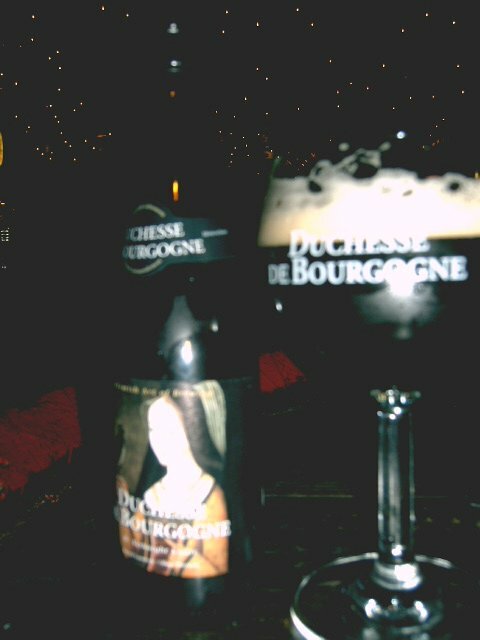 The Duchesse du Bourgogne is brewed at the Brewery Verhaege, its existence dating back to 1892. This is the beauty with Belgian beers, they all have years of history behind them. Still a family business, the brewery produces 6 beers today: the Cambrinus, the Christmas-Verhaege, the Duchesse du Bourgogne – tried and tested, the Echte Kriek, which means as much as the real Kriek, the Verhaege Pils and the Vichtenaar. I wonder how long it will take me to go through all the different beers Belgium has to offer, big and small producers alike? The Duchesse du Bourgogne has a fruity character, and 6,2% alcohol. Usually served between 8 and 12°C. Who can resist a beer with the name of Malheur (bad luck)? I guess I am not one. With such a name, I just had to try this beer. 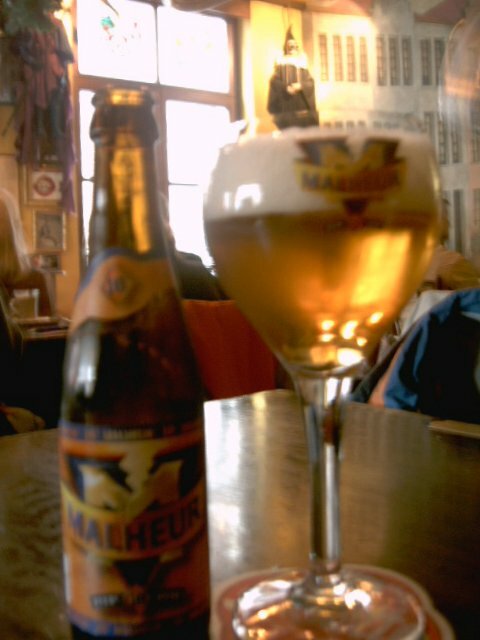 So I ordered a Malheur 10, a beer with hints of orange and lemon. Brewed in Buggenhout, one can trace the beer back to 1773 when Balthazar De Landtsheer established his first brewery, ‘De Halve Maan’. Currently 6 different Malheurs are brewed, the 6°, 8°, 10° and 12° as well as the Biere brut and Dark Reserve. I personally tried the Malheur 10°. Almost a weak wine. But all worth it. Boil and purée the potatoes. Fry the onion, add the squash and half a bottle of beer, and simmer over low heat. Season to taste. Purée the squash when cooked. Mix the two purées, and add the sunflower seeds. Add 1tbsp of white wine to the fish aroma and reduce to ¼ of the liquid. Add a knob of butter and mix to a smooth sauce. Keep warm. Cut 4 identical triangles of bread. Lightly fry the bread, then transfer to oven till crisp. Place the parmesan shaves on baking paper, and melt in the oven. Coat the bread with the melted parmesan. Mix the rest of beer and veal stock to create a thick sauce. Cut the turbot into 4 equal pieces. Lightly fry the turbot in a little butter, add the shii-take to the pan and place in the oven at 180°C. Place the purée mix in the middle of the plates, the turbot on top. Place the parmesan toast on top of the turbot, and add some more purée mix; add the shrimp croquettes and shii-take. Cover the whole in Malheur sauce. Last weekend was spent discovering new beers while taking the tourist trail in Brussels. Despite living here for almost 10 years, it is still amazing how many hidden places I discover. I have either avoided many because they came across as ‘tourist traps’, or because, simply, I never found them. Till last Sunday. Not only did we discover a new beer bar (which I am sure most know), but also a new beer: Urthel. 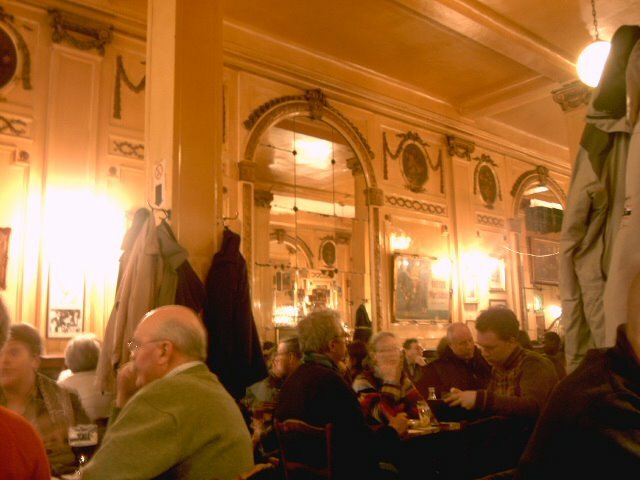 The bar is the Poechenellekelder, on Rue du Chene 5 in 1000 Brussels. And Urthel seems to be ‘Belgium’s newest cult beer’. Unfortunately I don’t fully understand the legend and story behind the beer, but it does seem to be a fascinating legend of elves and Erthles, who can be traced back to the 17th century. Erthles are fantasy creatures, not taller than 40cm, bald head, round figured, a big nose and heavy beards. They can live to be 280, and they love poetry, music, singing and dancing. Happy creatures it seems. If I understand correctly the Erthels live in the Leye valley. Now Urthel is brewed at the Leyerth brewery, and is (who saw this one coming) the magic drink of the Erthels. And the story goes on – unfortunately only in Flemish, so difficult to understand the whole plot. But I do suggest you try the beer, as it indeed a different beer, maybe on the way to become the cult beer of Belgium. Slice the leeks into rings, wash and drain. Heat the oil in a frying pan and lightly cook the turkey. Turn the heat down. Pour over the turkey the leek and half the chicken stock and bring to a simmer. Let the whole cook for 25min. Season to taste. Let the turkey cool down, and cut into 8 even slices. Roll the ham around the turkey slices and close with tooth picks. Heat the rest of the stock, and add the Urthel beer, the grated cheese and cream. Continue stirring till you have a thick sauce. Place the turkey and ham rolls into a dish and pour the beer, cheese and cream mixture over. Put the dish under a grill, till the mixture is golden brown. Serve with toast or ciabatta, and an Urthel beer. Back in 1100 the Count of Flanders, known as ‘Baldwin Hapkin with the Axe’, commissioned the Ten Duinen Abbey to brew a strong blond beer. The legend says that the beer brewed made the count and his soldiers invincible in battle. And this is how the Hapkin beer was born. 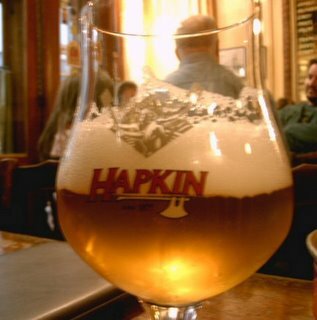 Nowadays Hapkin is brewed by Alken-Maes. Hapkin is a beer with a flowery aroma, a mild malt character and a sparkling perfumed fruitiness. 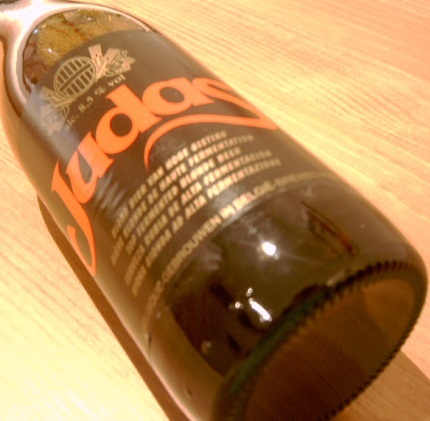 In true Belgian tradition, this beer has a high alcohol percentage as well, ranking at 8.5%.